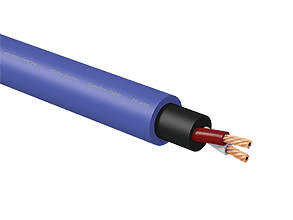 The major difference between Furutech's standard "Alpha" speaker cable, and this Alpha 36, is the addition of the carbon particles in the filler core and black inner sheath/filler PVC. This filler material offers superior damping properties, and makes this Furutech's FS Alpha 36 their highest performing speaker cable available in bulk for DIY. Pair with your favorite speaker cable connectors and own a world class speaker cable for your stereo system. More info may be found in this PDF.